Are You Going Through a Storm Cloud Experience? Yesterday, Gail and I began a 30-day sabbatical. We spent the day traveling to a remote retreat, 8,700 feet up in the mountains. We have no real plans other than to pray, read, and dream. The last time I did this was 1994. On the plane, I intended to write a blog post. While this may seem like work for some, for me it is like oil painting—except with words. My heart comes alive as I give expression to my thoughts. But instead of blogging, I decided to finish reading Ian Cron’s new book, Jesus, My Father, the CIA and Me: A Memoir of Sorts. Honestly, I was blown away. I couldn’t put it down. I connected emotionally and aesthetically with so much of it. If you enjoyed Don Miller’s book, A Million Miles in a Thousand Years, you will love Ian’s book. I was captivated not only by his personal journey (much of which paralleled my own), but by the way he expressed it. Ian is an enormously gifted writer. In 1959, Lieutenant Colonel William Rankin was flying his supersonic jet at forty-eight thousand feet when it suffered a catastrophic engine failure. He was forced to eject from his aircraft over a cumulonimbus—a gigantic storm cloud that gives even seasoned pilots the intestinal cramps. “You’ve seen one. 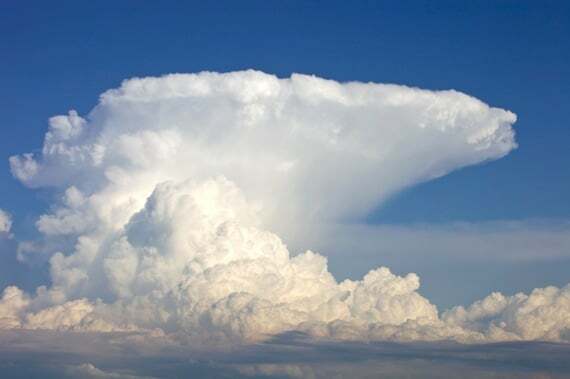 When fully mature, the cumulonimbus is a cauliflower-shaped cloud with billowy towers and turrets that can reach altitudes of seventy-five thousand feet. On its peak sits its distinct anvil-shaped top. When a group of cumulonimbus clouds get together, they form menacing supercells. You don’t want to attend the party unless you are one of those supernaturally stupid people on the TV show Storm Chasers. “Colonel Rankin is the only man to fall through the ‘king of clouds’ and live to tell the tale. In the center of the cloud Rankin was met by rising air blasts that shot him heavenward, then hurled toward earth by brutal downdrafts. Large hailstones at the mercy of the same forces pummeled the helpless pilot. Bolts of lightning passed frighteningly close, followed by thunder so fierce than Rankin claims he felt it more in his body than his ears. I don’t don’t about you, but for me, 2005 was a giant storm cloud experience. Some day I’ll blog about it. Frankly, I am still amazed that I survived. But God is good. I did survive and I am better because of it. Unfortunately, you don’t usually know the outcome in the midst of a storm. Life seems to hang in the balance. Usually, you are just holding on, praying that you aren’t destroyed in the process. If this describes you, you are not alone. It happens to all of us—usually more than once. Question: What about you? Are you going through a storm cloud experience? You can leave a comment by clicking here.